Visual Studio | Neo Fight! One of the things I find really annoying in Visual Studio 2012 is how hard it is to get to the Source Control Explorer in Team Foundation Server. Because of the new “drop down” interface, you have to go to “Home” and then choose Source Control Explorer. This is rather counter intuitive, and somewhat annoying. Fortunately, there is an IDE Command: View.TfsSourceControlExplorer. 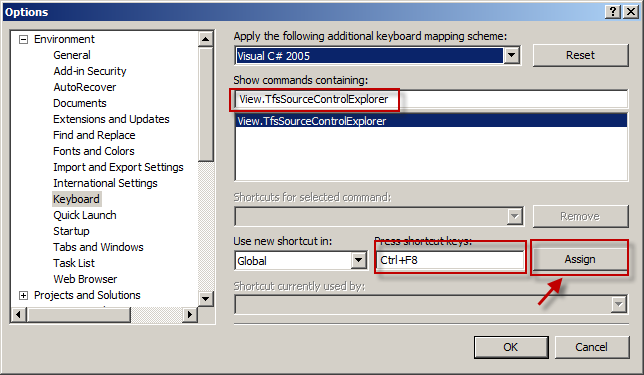 You can map this to a short cut key in Tools > Options > Environment > Keyboard. If your Intellisense in SQL Server Management Studio just stopped working, chances are you have applied Visual Studio 2010 SP1. This is because there is a compatibility issue between Microsoft SQL Server 2008 R2 Management Studio (SSMS 2008 R2) and the Transact-SQL Language Service that is included in Visual Studio 2010 SP1. All you need to do is download the pack, install it, and go back to saving your keystrokes.